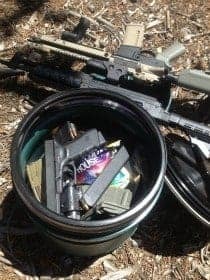 Survival caching supplies is not a new concept in the survivalist and prepper’s world, but people have long wondered about the durability of their containers and the safety of its contents. Potential caching containers come in all shapes and sizes but they are not created equal. We have heard of buried automobiles, buses, dish washers, and chest freezers. Ammo cans slathered with roofing tar are an old standby. Other military surplus items like sonar buoy tubes, 120mm cans and reverse osmosis filter containers are used when you can find them. Plastic pipe (PVC or ABS typically) works well and can be very inexpensive in smaller sizes, however in the larger sizes, PVC pipe can be very expensive. A guy could spend over a hundred bucks on a single 12” PVC end cap. Such vaults tend to be one time use assemblies unless you can get the rubber gasket fittings and some grease. Also, time is money. The time you spend creating your survival cache container is time you could be spending on other preparedness tasks. All of these solutions involve the re-purposing of something designed for something else….that is until now. Recently the team at SurvivalCache.com found and tested a breakthrough caching container. The new containers are called Monovaults and they are designed as an off the shelf caching system letting you spend your time considering the contents of your cache instead of reinventing the caching container wheel. Also, they are designed and manufactured in the United States by a company out of Idaho called Polyfarms. The team at Polyfarms is dedicated to preparedness and has really thought through the problems of storing items underground. Monovaults: The job of any caching container is to get between your valuable stuff and those elements that would harm it. To this end, the Monovault system has three components. The choice of material for the team at Polyfarm is a rugged commercial grade polyethylene vault (that means non-metallic for those metal detector sensitive applications) which is designed for burial with a large opening and spin on “gamma” lid equipped with an o-ring gasket. This lid seals up tight over and over without tools. Protecting this lid is a heavy shield cover that serves to run water away from the inner lid gasket and keeps the inner lid safe from mechanical damage. The shield cover also allows for aggressive recovery ensuring that you are unlikely to damage anything with your shovel as you remove covering soils. Once soils are cleared away, the shield lifts off to reveal a clean access to your vault. The wall thickness of the monovault is about ¼”. Tough enough to bury but still light enough to pack around. Polyethylene is less brittle than PVC at lower temperatures and better equipped to absorb the stresses of a frost line in those northern climates. We can tell you that these things are a lot tougher than they appear in photos or even in person. You have to actually get your hands on one to appreciate the toughness of the construction. Humidity control is a must for all survival cache containers. All plastic breathes at some very low level. A desiccant is a key component of the caching system. The desiccant adsorbs (This is not a typo, Adsorb is different from absorb) the moisture in the vault at the time of install and stands by to adsorb whatever moisture may migrate into the vault during the caching period. The system included with monovault mastercacher system comes equipped with a desiccant with a humidity indicator to signal the need to be replaced or recharged. The desiccant supplied is rechargeable in a typical oven per instructions on the packaging. The desiccant supplied should be good for several years without maintenance. Additional desiccants can be employed for longer term applications in the monovault. Note: You can buy the Monovaults separately or buy what is called the Master Cacher System which includes the Monovault and all of the environmental proof bags and dehumidifiers. Corrosion Control refers to the use of Vapor Corrosion Inhibiting technology or VCI. The monovault system uses VCI bags infused with a special chemistry that out-gases from the bag and protects metal surfaces with a one molecule thick layer of corrosion inhibitor. The VCI compound flashes off immediately upon removal from the bag. The VCI bags supplied are rated to perform for up to 5 years. Your monovault system will also come with one or more special double layer bags (the second layer being an outer metalized barrier) rated for up to 20 years. The longer your monovault is left undisturbed, the longer the VCI is likely to perform. Designed with firearms in mind, the monovaults presents a turn-key system for long term storage. Put your gun in a bag, the bagged gun in the vault, and install the desiccant in the vault outside of the bag. Ammunition, parts, and accessories can be stored the same way. The mastercache 212 universal kit used as a basis for this review stands about 12.75″ inches tall and 13” in diameter. It fits many pistols, freeze dried food packs, water, survival tools, shelters, and warm clothes. The monovault comes in several different sizes including the largest model called the 248 which stands 47.75″ and weighs 18 pounds. Whether standing by as a grab and go emergency kit, tucked away in a crawl space, or buried along your bug out route, you will find the monovault a fast, easy and convenient way to get you and your family prepared.